Explain the simple theory of color vision. Outline the coloring properties of light sources. Describe the retinex theory of color vision. Cones are most concentrated in the fovea, the central region of the retina. There are no rods here. The fovea is at the center of the macula, a 5 mm diameter region responsible for our central vision. The cones work best in bright light and are responsible for high resolution vision. There are about 6 million cones in the human retina. There are three types of cones, and each type is sensitive to different ranges of wavelengths, as illustrated in Figure 1. A simplified theory of color vision is that there are three primary colors corresponding to the three types of cones. The thousands of other hues that we can distinguish among are created by various combinations of stimulations of the three types of cones. Color television uses a three-color system in which the screen is covered with equal numbers of red, green, and blue phosphor dots. The broad range of hues a viewer sees is produced by various combinations of these three colors. For example, you will perceive yellow when red and green are illuminated with the correct ratio of intensities. White may be sensed when all three are illuminated. Then, it would seem that all hues can be produced by adding three primary colors in various proportions. But there is an indication that color vision is more sophisticated. There is no unique set of three primary colors. Another set that works is yellow, green, and blue. A further indication of the need for a more complex theory of color vision is that various different combinations can produce the same hue. Yellow can be sensed with yellow light, or with a combination of red and green, and also with white light from which violet has been removed. The three-primary-colors aspect of color vision is well established; more sophisticated theories expand on it rather than deny it. Figure 1. The image shows the relative sensitivity of the three types of cones, which are named according to wavelengths of greatest sensitivity. Rods are about 1000 times more sensitive, and their curve peaks at about 500 nm. Evidence for the three types of cones comes from direct measurements in animal and human eyes and testing of color blind people. Consider why various objects display color—that is, why are feathers blue and red in a crimson rosella? The true color of an object is defined by its absorptive or reflective characteristics. Figure 2 shows white light falling on three different objects, one pure blue, one pure red, and one black, as well as pure red light falling on a white object. Other hues are created by more complex absorption characteristics. Pink, for example on a galah cockatoo, can be due to weak absorption of all colors except red. An object can appear a different color under non-white illumination. For example, a pure blue object illuminated with pure red light will appear black, because it absorbs all the red light falling on it. But, the true color of the object is blue, which is independent of illumination. Figure 2. 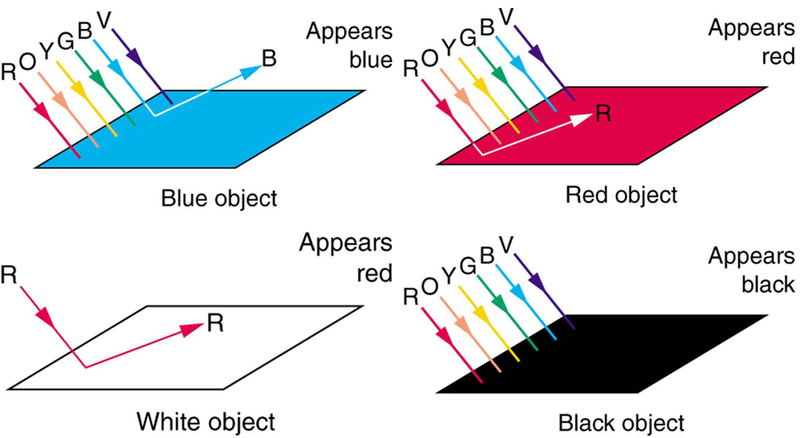 Absorption characteristics determine the true color of an object. Here, three objects are illuminated by white light, and one by pure red light. White is the equal mixture of all visible wavelengths; black is the absence of light. Similarly, light sources have colors that are defined by the wavelengths they produce. A helium-neon laser emits pure red light. In fact, the phrase “pure red light” is defined by having a sharp constrained spectrum, a characteristic of laser light. 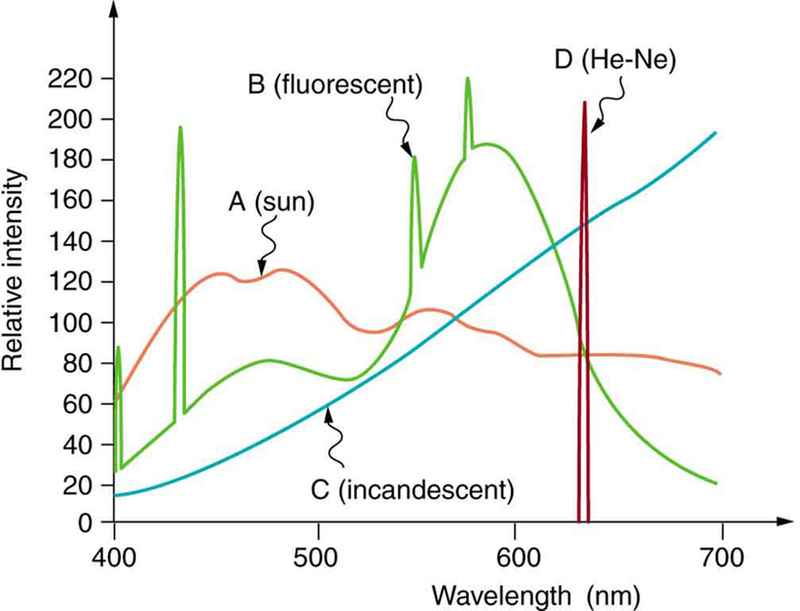 The Sun produces a broad yellowish spectrum, fluorescent lights emit bluish-white light, and incandescent lights emit reddish-white hues as seen in Figure 3. As you would expect, you sense these colors when viewing the light source directly or when illuminating a white object with them. All of this fits neatly into the simplified theory that a combination of wavelengths produces various hues. Figure 3. Emission spectra for various light sources are shown. Curve A is average sunlight at Earth’s surface, curve B is light from a fluorescent lamp, and curve C is the output of an incandescent light. The spike for a helium-neon laser (curve D) is due to its pure wavelength emission. The spikes in the fluorescent output are due to atomic spectra—a topic that will be explored later. The eye-brain color-sensing system can, by comparing various objects in its view, perceive the true color of an object under varying lighting conditions—an ability that is called color constancy. We can sense that a white tablecloth, for example, is white whether it is illuminated by sunlight, fluorescent light, or candlelight. 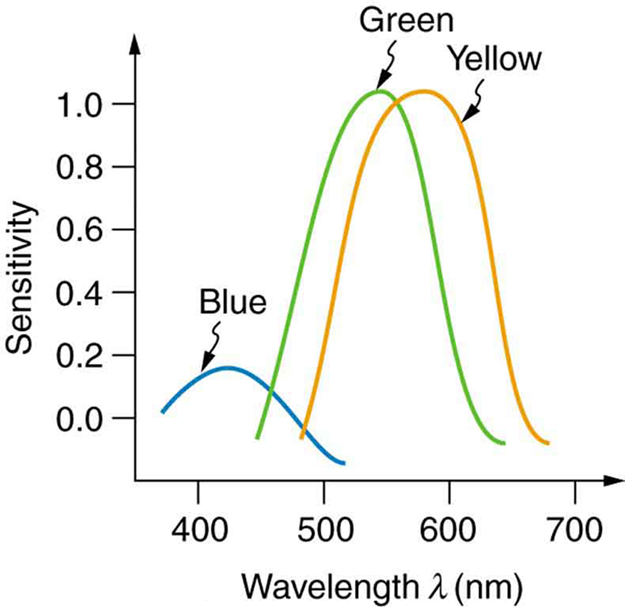 The wavelengths entering the eye are quite different in each case, as the graphs in Figure 3 imply, but our color vision can detect the true color by comparing the tablecloth with its surroundings. Theories that take color constancy into account are based on a large body of anatomical evidence as well as perceptual studies. There are nerve connections among the light receptors on the retina, and there are far fewer nerve connections to the brain than there are rods and cones. This means that there is signal processing in the eye before information is sent to the brain. 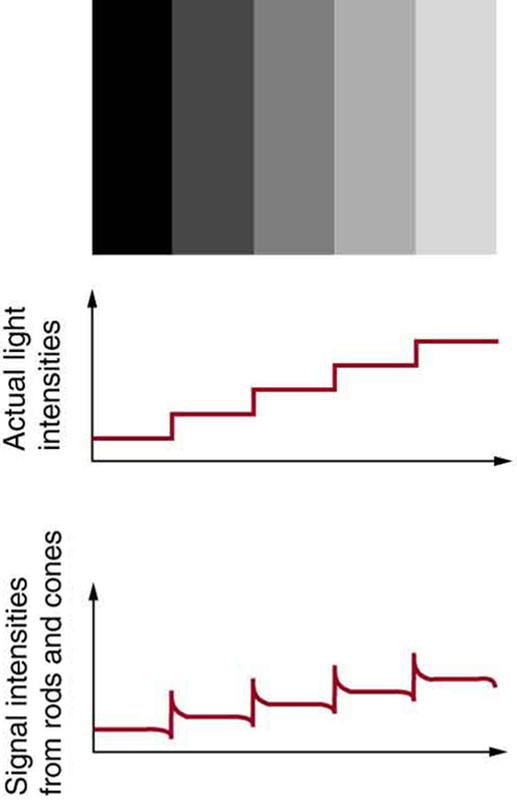 For example, the eye makes comparisons between adjacent light receptors and is very sensitive to edges as seen in Figure 4. Rather than responding simply to the light entering the eye, which is uniform in the various rectangles in this figure, the eye responds to the edges and senses false darkness variations. Figure 4. The importance of edges is shown. Although the grey strips are uniformly shaded, as indicated by the graph immediately below them, they do not appear uniform at all. Instead, they are perceived darker on the dark side and lighter on the light side of the edge, as shown in the bottom graph. This is due to nerve impulse processing in the eye. 1: A pure red object on a black background seems to disappear when illuminated with pure green light. Explain why. 2: What is color constancy, and what are its limitations? 3: There are different types of color blindness related to the malfunction of different types of cones. Why would it be particularly useful to study those rare individuals who are color blind only in one eye or who have a different type of color blindness in each eye? 4: Propose a way to study the function of the rods alone, given they can sense light about 1000 times dimmer than the cones. 26.3 Color and Color Vision by OpenStax is licensed under a Creative Commons Attribution 4.0 International License, except where otherwise noted.